While I realize the recording is terrible, that is what makes it charming to me. A lot like Minor Threat's early work, raw with a real basement sound. These are the names I have given to these on my own digital recordings. Only Track One and Track Four are confirmed by later releases. The thing that stands out most to me on this is just how good Darren Llyod was (and likely is) on the drums. Love the jazz drumming influence he brought to the table. Thanks for the tunes, kids. Still loving them today! This tape was taken from the Shepard landfill in a box of unwanted cassettes. Tracks were recorded with a 10 dollar ghetto blaster. 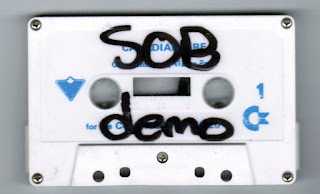 This was the first demo we handed out to clubs in an attempt to get gigs. Amazing as it is, it worked.